Getting away from the standard style of Game of Thrones sets geared to just one season, 2017 Rittenhouse Game of Thrones Valyrian Steel covers seven years of Westeros in one go. While prior card releases, like Season 6, concentrate on just one year of the hit series, Valyrian Steel is much more comprehensive. 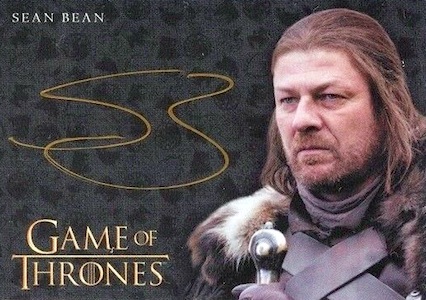 The premium options are also taken up a notch with the "Big Hit" group that includes autographs, sketches and relics. With one hit per pack, every box contains at least two autographs and SRP is $160 per box. 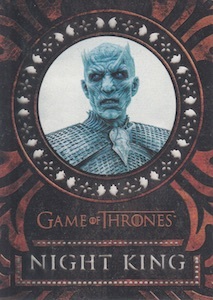 The 100-card base set immediately stands apart because it includes metal cards that touch on the first seven seasons. Collectors got their first look at the concept as a case topper in Season 6. The "Tech" inserts, which combine to average one per pack, include Base Gold Metal, 3D Lenticular and Laser Cut cards. The Base Platinum Metal parallel is not found in packs, and instead, the full 100-card set acts as a 10-case incentive. 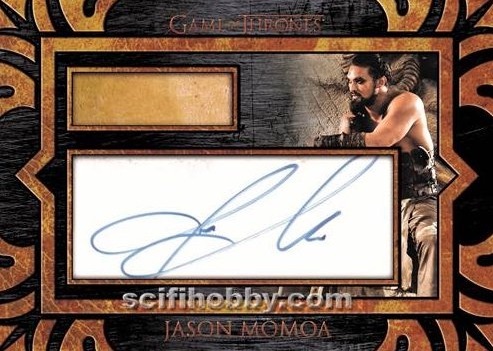 Much of the excitement in the 2017 Rittenhouse Game of Thrones Valyrian Steel checklist is found in the "Big Hit" category. 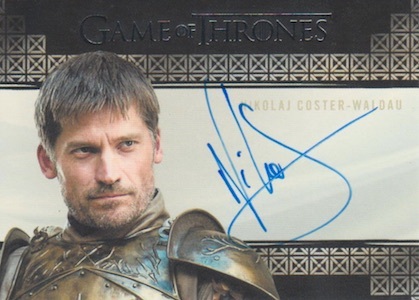 Signed choices include Gold Autograph, Valyrian Autograph, which features many multi-episode signers, and Dual Autograph cards. Tying directly into the show, the Pin Relic set includes replicas for Daenerys Targaryen’s Hand of the Queen pin, The Night King’s pin, and the Faceless Man coin. 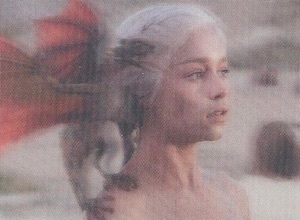 In addition, Costume Relic cards contain actual worn wardrobe pieces for Daenerys and Tywin Lannister, among others. 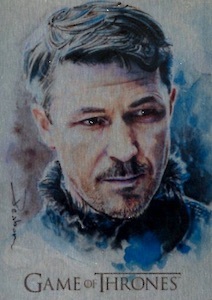 Drawn by David Desbois, the debut for Character Sketch cards comes in Valyrian Steel, with Scenic Sketch cards also found. Finally, limited Artifex cards are numbered to just 25 copies. A standard option for the card maker, the 2017 Rittenhouse Game of Thrones Valyrian Steel album includes an exclusive metal promo card. 100 cards, plus 2 alternate exclusives. Shop base cards on eBay. PARALLEL CARDS: Gold Metal #/100, Platinum Metal (10-case incentive). Print Runs: Extremely Limited (EL) = 100-200 copies, Very Limited (VL) = 200-300 copies, Limited (L) = 300-500 copies. 35 cards. Shop on eBay. 6 cards. Serial numbered #/25. Shop on eBay. 3 cards. Shop on eBay. 6 subjects. Shop sketch cards on eBay. 20 artists. Shop sketch cards on eBay. 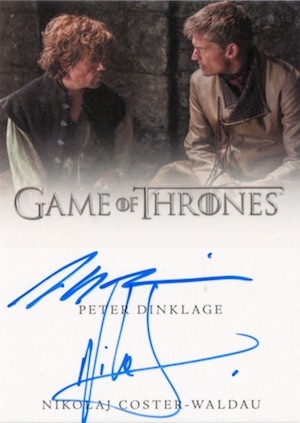 Still can’t pin down Pedro Pascal for an autograph. I enjoyed breaking this box. The metal cards and autos are very nice. That said, the price point of about $200 on this one was a little steep for the return. At $150, I definitely would have purchased another couple boxes. 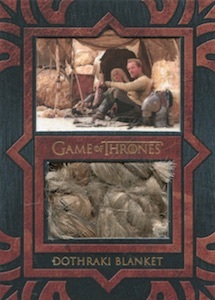 2013 RITTENHOUSE HOUSE GAME OF THRONES SEASON 2 HOBBY BOX FACTORY SEALED RARE!!! 2013 RITTENHOUSE HOUSE GAME OF THRONES SEASON 1 HOBBY BOX FACTORY SEALED RARE!! !